Michigan rockers Still Remains have announced their first UK shows in nearly a decade. 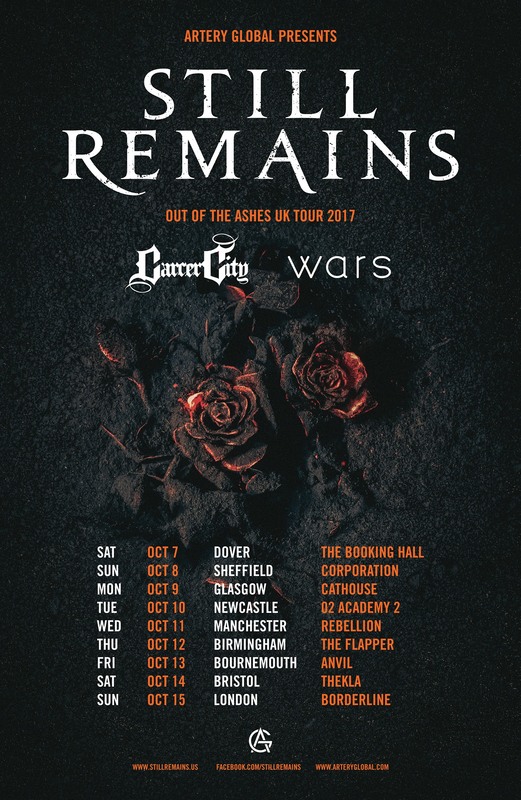 The band return to the UK in October for 9 headline shows, bringing Wars and Carcer City as their special guests. Signed to Roadrunner Records, Still Remains released their widely praised debut album “Of Love and Lunacy” in 2005. The record included their classic tracks “The Worst is Yet to Come’ and “White Walls”, as well as a cover of Nine Inch Nails epic, “Head Like A Hole”. In 2007, the group released second album “The Serpent”, spawning fan favourites “Dancing with the Enemy” and “Stay Captive”. Following hundreds of shows around the world, hitting the stage with bands like Trivium, Atreyu, and Bullet For My Valentine, as well as playing at all the major rock festivals, the band went on hiatus in 2008. It took five years, but in 2013, the reunited band created latest album “Ceasing to Breathe”, including the single “Close to the Grave”. Now, another four years on, the band are returning to the UK for their first shows here in nearly a decade. Frontman TJ Miller enthuses: “We have always seen the UK as our home away from home… kind of like a nice summer cottage where we can get away and party every night with the best fans in the world! Like rekindling a relationship with a long-lost best friend, it will be like we never left. But the best is yet to come! Let’s get weird, UK”. Tickets are on sale now for the following headline dates… Head on over to our “shows” section to pick up tickets! We officially have t-shirts in our web store! It has been a seriously long time since we made shirts. We hope you all like them. We will have more designs and merch items soon so please keep checking back. Also, we are in the midst of booking some weekend shows. We hope to get those posted shortly as well! We owe a large thank you first and foremost to every Kickstarter funder. Thank you very much for your support of this album. Without you it would have been nearly impossible. The album is 12 songs of brutality. We couldn’t be happier with how the songs turned out and we hope that you all like it as well. If you want to pick up our album, you can do so in our webstore. We are selling both a digital version and a physical version (CD). Or, you can buy both in a bundle. Please keep checking back, we will be posting more news, updates and hopefully some concert dates! Lastly, if you love the album, please tell your family and friends about it. Send them the link to our store and encourage them to pick up a copy. Thanks for the love.